My little girl LOVES muffins! A few weeks ago she asked me for a muffin for breakfast. Unable to resist her cute face, I agreed and found this recipe in a Taste of Home Cookbook I have entitled “Grand Prize Winners.”…. Grand Prize of Taste of Home you say?… Okay! I’ll do it! They were a smash hit! Goodness these muffins were DELICIOUS! Try them out and you be the judge if they are a Grand Prize Winner in your home! 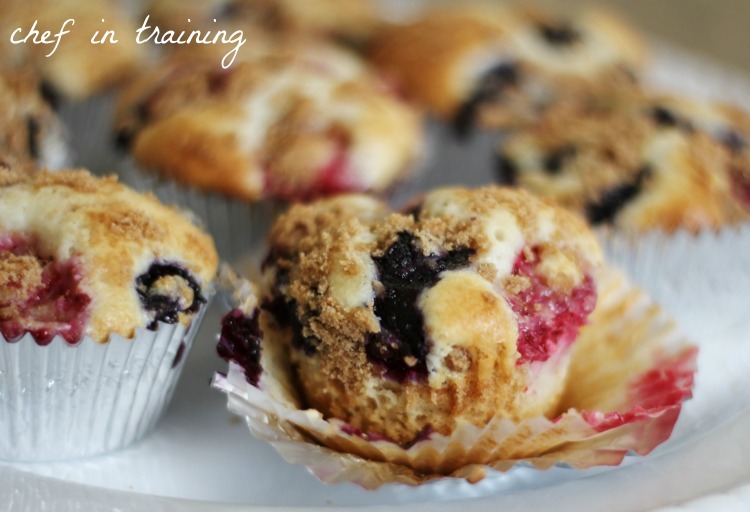 Delicious and soft Berry Filled muffins the whole family will love! In a large bowl, cream butter and sugar until light and fluffy. Add eggs, one at a time, beating well after each addition. Beat in milk. Combine the flour, baking powder and cinnamon; gradually add to creamed mixture just until moistened. Fill greased or paper lined muffin cups one-third full. In a small bowl, beat the cream cheese, sugar and egg until smooth. Fold in the berries. Drop a rounded tablespoonful into the center of each muffin. Bake at 375 degrees F for 25-30 minutes or until a toothpick inserted near the center comes out clean. Cool for 5 minutes before removing from pans to wire racks. Serve warm. Refrigerate leftovers. Wow, these look amazing! Thanks for the great recipes! Can't wait to make these tomorrow! I got the new Philadelphia Indulgence white chocolate cream cheese, so hopefully it will be a great dessert! This sound so luscious. If I had the blueberries, I'd try to make it right now. I will send this to my daughter. Thanks. Thanks for sharing this recipe. I've been looking for one that has a cream cheese filling! Berry picking is opening this week for us, and I think this will be the recipe for us to make when we get home. My girls will love these. Thanks for the recipe! This was amazing! I tried this and it made all my sweet tooth dreams come true. Also used the berries and cream cheese I've been hoarding for some time as well.